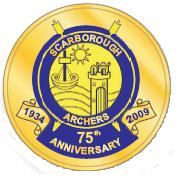 Formed in 1934, Scarborough Archers club celebrated its 75th anniversary in 2009. The meeting at which the club was formed was held in Rowntree’s Cafe in Westborough on May 8 1934, under the chairmanship of Mr JW Butler and membership fees were set initially at five shillings. Over the years Scarborough Archers has had several different homes, including Burniston Sports Ground, Oriel Cricket Ground, farmland which is now the site of Raincliffe School, North Bay, where Atlantis waterpark stood, Scarborough College, McCain’s Sports Club in Cayton, Seamer Sports Association, and the club’s current home on Osgodby Lane, between Cayton and Osgodby. Today the club has over 60 members, many of whom shoot in tournaments as well as for pleasure at the club’s grounds. Members mainly shoot recurve bows, as used in the Olympics, though new members of all disciplines and levels of experience are welcome.